The Central Bank of Nigeria on the 13th of September 2018 introduced a Regulation for Instant Electronic Transfer Funds (EFT) Services in Nigeria. The new regulation titled: ‘Regulations on Instant (Inter-Bank) Electronic Funds Transfer Services in Nigeria’ was issued to all deposit money banks, microfinance banks, mobile money operators and other financial institutions; with the aim of regulating all Instant EFT services on various payment channels in Nigeria. The Regulation prohibits Sending Entities from providing Instant Electronic Fund Transfer Services to anyone who does not have a bank account in Nigeria. In line with its objective of promoting sound financial systems in Nigeria, the CBN under this Regulation mandates Sending Entities to ensure that EFT messages contain the sender’s name, BVN and Account number, beneficiary’s name, account number and narration information specified by the Customer at the point of initiating the transfer, to aid reconciliation. It provides further that where an EFT fails, the Sending Entity shall refund into the Customer’s account full proceeds returned by the Receiving Entity within 10 minutes of receiving same. The Regulation states that where a sending entity erroneously sends a value contrary to the Customer’s instruction to a receiving entity and requests the reversal in writing within 14 working days of the transaction, the Receiving Entity should oblige within one business day without recourse to the Customer who benefitted from the erroneous transaction provided the funds are available in the wrongly credited Customer’s account. Where the funds are no longer available in the Customer’s account, the Receiving Entity should immediately notify its Customer that the account was wrongly credited and provide proof of such notification to the Sending Entity. Furthermore, the Receiving Entity is to notify the Customer about the consequences of not funding the account within 24 hours, which includes sanctions such as watch-listing, credit bureau, and reporting the Customer to the law enforcement agencies. The Regulation also makes provisions for situations where a transfer is made in error by the Customer. Where the beneficiary is known to the complainant, the apex Bank and the Sending Entity shall encourage the complainant (in this case the Customer who made the erroneous transfer) to contact the beneficiary in an amicable manner for a refund. However, where the beneficiary is unknown to the complainant, the Sending Entity having received a tenable complaint from a Customer shall notify the Receiving Entity. Upon notification, the Regulation provides that the Receiving Entity shall place a lien on the amount in the account of the beneficiary and thereafter obtain the consent of the beneficiary to execute a refund. Again, the Regulation provides that a failed NIP Transaction not reversed into a Customer’s account within 24 hours (based on a complaint from a sender and/or a beneficiary) would attract a sanction of N10, 000 per item. Also, any delay in application of inward NIP into a beneficiary’s account beyond 4 minutes (based on a complaint from a sender and/or a beneficiary) would equally attract a sanction of N10, 000 per item in addition to any other sanction prescribed in the Nigeria Bankers’ Clearing System rules or any amendment thereto. Furthermore, the Regulation imposes rights and responsibilities on the Bank Customers involved in electronic transfers. In effect, a bank Customer in an EFT transaction is required to provide accurate beneficiary account details for every EFT instruction. Where the Customer experiences problems arising from the EFT transaction, the Regulation mandates the Customer to promptly report the issue to the Sending/Receiving Entity. In line with the dispute resolution procedure in Article 10 of the Regulation, Section 5.4 of the Regulation provides that where a credit has been erroneously applied to a Customers’ account with the Receiving Entity, the customer shall promptly notify the Receiving Entity and authorise the reversal of such erroneous credit. In the event that the customer’s account is unfunded, the Regulation stipulates that the Customer shall provide funds within 24 hours and failure to do so shall be a ground for watch-listing of the Customer, credit bureau, and reporting the defaulter to law enforcement agencies. The move by the CBN to regulate Electronic Fund Transfers and problems arising therefrom is commendable. In an accompanying circular, the Apex Bank stated that the regulation shall take effect from the 2nd day of October 2018. It is therefore imperative for all EFT stakeholders to be familiar with the responsibilities imposed by the Regulation to avoid any of the stiff penalties applicable thereunder. The Nigerian Bar Association (NBA) Annual General Conference (AGC), which commenced in Abuja on Sunday, is coming on the heels of a number of controversies that have trailed the association in recent weeks. The programme, which will hold August 26-30 in Abuja, will have as its theme: ‘Transition, Transformation and Sustainable Institutions’ with Ghana’s President, Akufo-Addo as keynote speaker. Among the controversial issues is the ratification of the just-concluded NBA national elections by the National Executive Committee (NEC) . The other candidates in the election that produced Paul Usoro (SAN) as the new President of the NBA, were Prof Ernest Ojukwu (SAN) and Arthur Obi-Okafor (SAN) have both criticized the election. There are also rumblings over moves to amend the NBA constitution during the AGM. Lawyers claim the newly elected executive will be used to implement the new constitution. Former General Secretary of the NBA, Femi Adesina (SAN) and former NBA President, Wole Olanipekun (SAN) among others have kicked against the constitution amendment by the Abubakar Mahmoud (SAN) outgoing executive especially in the area of succession of the governing board of the association. “I was the General Secretary of our great Association between August 2002 and August 2004 and a life member of the National Executive Committee, yet I never received the Notice of the proposed Amendment to the Constitution from the General Secretary of the Bar up to the date of writing this publication,” Adesina said. Olanipekun said the amendment is coming despite advice by former presidents and secretaries of the association to postpone such amendment to a later date. “You are advised not to force the amendments on our beloved Association at the AGM, which, with much respect, might be constituted in such a way that the attendees would not readily understand or appreciate the unending conundrum we will be plunged into if the amendments sail through. And in case you insist on going ahead to present the amendments at the AGM, can you be gracious enough, as a lawyer and leader, to circulate this letter of mine to the AGM,” he said. Also, many lawyers have complained that the conference bags for this year’s conference is not with the tablets as contained in the previous edition despite the spending of N750 million to organize the conference and the retention of the fees like the previous year. The 58th conference will have five sub-themes which include Political Transition and Governance; Rule of Law & Security; Sustainable Economic Development; Technological Disruptions; and Diversity and Inclusion. The stakeholders will examine the theme of ensuring peaceful and successful transitions, drawing references from Africa, the Americas, Asia and Europe. The NBA AGC will be held in partnership with the British-Nigeria Law Forum (BNLF), the Bar Council of England and Wales, the American Bar Association (ABA) and other bar associations from across the continent and they have offered to provide technical support to the conference planning. 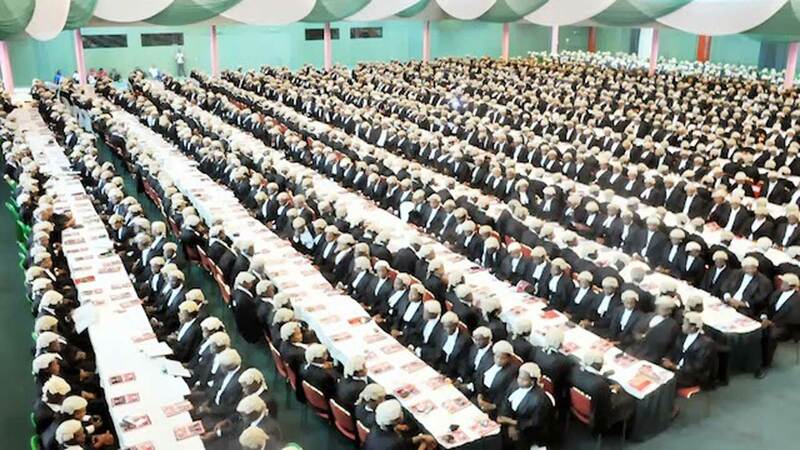 About 10, 000 lawyers, the biggest gathering in Africa, are expected to attend the conference in Abuja. Besides, the keynote address by the President of the Republic of Ghana, Nana Akufo-Addo, there will be a conversation with President Muhammadu Buhari, and an address by a former Head of State of Nigeria, General Abdusalami Abubakar (Rtd), who is generally acclaimed to have overseen one of the most peaceful transitions of power from military to civilian authorities. The conference will also feature high level panel discussions by renowned global and industry leaders in various fields as well as a complement of young minds who will be making robust contributions to nation-building from their perspectives. I think a lot of people have been debarred the opportunity of attending the conference. It looks to me that certain cabals, who actually want to restrict the attendance of the conference to only the moneybags, have hijacked our noble association. It will interest you to know that the registration fee for members who are just between 1 to 5 years is N80, 000, which is the least. Members who are 20 years and above are to pay N300, 000, while the SANs will pay N500, 000, apart from the practicing fees and the branch dues already paid by these members. To me, this is purely exploitative, to say the least. The executive members of the association did not take into cognizance, the economic realities in Nigeria before fixing these exorbitant fees. We should also bear in mind that lawyers’ incomes are very irregular. In all of these, my dream NBA is that which will be concerned at all times with the welfare of its members; an association that will ensure that there is absolute compliance with the rule of law. A body, which will be the mouthpiece of the downtrodden in the fight against corruption! What I observed is that almost everybody is contesting for one position or the other in the NBA for his or her selfish interest, to make money for themselves in particular, among other benefits. If I have any expectation, it is that other lawyers, especially the young ones should set up an alternative association like many organs of governance in this country. The association has had its cradle steadily desecrated. The only rationale for being a member and being called one is to pay Practice Fee. Those have been astronomical by your years of supposed practice at the bar. So we pay, not because we believe the funds are judiciously utilized but because we would want to practice. The entire processes of the last elections were a ruse. If the banking sector has produced BVN, why can’t all lawyers be automatically recognised and businesses of the NBA conducted online? The NBA has been unable to maintain any justifiable fight nor championed one to a logical conclusion. We cannot even fight for the bench nor improved judicial processes. The NBA definitely requires a total makeover, now, more than ever before! We look forward to a period of happy reunion, in spite of the challenges our country is going through at the moment. Moving forward, one hopes, that the Bar will re-engineer itself ready and able to play our role as a vibrant and dependable bull work in the defence of the rule of law, democracy and democratic norms, especially now, that major elections are around the corner. I believe this can be done while ensuring the sustainability and growth of our profession, both as a business and social service! There is no alternative to rule of law, except anarchy. The rule of law must be obeyed. I want the NBA to look at the issue of rule of law for the love of the nation. People are looking forward to the NBA to be at the vanguard of the rule of law and due process. Aside that, the Bar should come forward as a unified body, irrespective of the grievances surrounding the election of Mr. Paul Usoro (SAN). It is an internal democracy, now that people have spoken that Usoro should lead for the two years, they should bury the agitation and give all necessary support to the newly elected officers. I am looking forward to a vibrant NBA and not a dormant one. I also want to see NBA confronting the excesses of the executives. NBA should return back to the days of Alao Aka Bashorun whose regime, NBA was able to confront and challenge the executive excesses and lawlessness. Even though it was military regime, the Aka Bashorun executives were able to champion them because of the truth and justice not to talk of democracy. In the past three years, some of us are no longer looking forward to the annual general conference, because of the way it is been conducted. I did not get a single material last year in Lagos and they said they gave us one Ipad that the battery does not last up to 10 minutes. To activate it, you go through hardship, visit Airtel office and at the end of the day, nobody is using it. Another issue is that of the election that is being questioned and the constitution that is being amended anyhow. The Bar is asleep, they need to bring the Bar back. It is not what it used to be. Bringing people to Abuja to just talk is not the NBA. So, that enthusiasm is no longer there to attend the conference. We need the NBA that will pose a confidence. We must reshape the organisation before we can now attend the conference. I have been attending conference every year but the past three years now, have not been there. We need the NBA that will speak. Lawyers are being harassed, beating here and there. We don’t want NBA that will be attachment to government. We want an NBA that would be independent body, a normal pressure group. We want an NBA that will make sure that the rule of law prevails in the country. That was what NBA was in the era of Alao Aka Bashorun. We want it to be back and up and give us hope. We want NBA that would be proud of its leadership. When we get that, the enthusiasm will be back and we will attend the conferences. Many people will not attend this year’s because of the administration of previous conferences. NBA conference is the gathering of highest number of lawyers in Africa. It is a forum where lawyers in all sphere of legal practice meet to deliberate on issues of law, the development of the legal profession and the challenges therein. I expect this year’s conference to focus on how the profession will be more developed in terms of dispensation of justice with a view to addressing the issues of the forthcoming general election in the country. The members of the body should distinct themselves from being used by politicians who want to achieve their goals at all cost. The body should ensure that the right persons become the leaders of the necessary units of government. The body should discourage delay of cases in court and rather fast track cases. Integrity should be the watchword of members of NBA across the globe. Acclaimed oldest Nigeria lawyer, Pa Tunji Fortunatus Gomez died Tuesday night. According to report, the death of Pa Gomez was officially announced by the Nigerian Bar Association, NBA, Lagos branch through its Chairman, Mr. Chukwuka Ikwuazom. Vanguard gathered that Pa Gomez as he was popularly called marked his 90th birthday some months back with pomp and pageantry. Announcing the lawyer’s passing away, the Lagos NBA branch chairman simply stated : “It is with a heavy heart that I announce the passing of Pa Tunji Gomez. Pa Gomez was until his death yesterday night, the oldest practising lawyer in Nigeria and a deeply loved member of the Premier Bar. “The Branch had, in recognition of his excellent service and uncommon devotion to the Branch, celebrated his 90th birthday in style a few months ago. Our deepest condolences go to his immediate family. We will greatly miss Pa Gomez and pray that his soul will rest in perfect peace. We will make further announcements in due course.” Pa Gomez was born in 1928 and enrolled into King’s College, Lagos in 1944. His activism manifested early in his eventful life, as he is reputed to have led the 1948 strike at the College which significantly turned around the fortunes of the students. Pa Gomez was part of the legal team that defended late Chief Obafemi Awolowo during his celebrated treason trial in 1962. The Edo State Governor, Mr. Godwin Obaseki, has inaugurated a 12-man Advisory Council on Prerogative of Mercy, headed by Hon. Justice Peter Isibor (Retd. ), with a charge to uphold mercy, where applicable, in the dispensation of justice. Speaking during the inauguration of the Advisory Council, Obaseki noted that prerogative of mercy ensures justice is served with mercy, but without perverting the course of justice. He said, “I believe in advising me you will balance the concept of justice with mercy for victims, victims’ family, society, the convicts and justice to all.” Other members of the council include Isaiah Gaja; the state’s Attorney General and Commissioner for Justice, Professor Yinka Omorogbe; Professor Violet Aigbokhaevbo; Mrs. F Osazee; Dr. Stephanie Ighedosa; Dr. E Oyanna; Mrs. Rosaline Edigin; Ven. Osaro Uyi Igbinosa, the state’s Controller of Prisons; the Commissioner of Police; and the Commander of the Nigerian Air Force. The governor said that during a National Economy Council meeting in Abuja, the National Committee on the Decongestion of Prisons and Awaiting Trial Inmates presented statistics of inmates awaiting trial and condemned criminals, revealing that Edo State ranked sixth in the country. The governor noted that with the inauguration of the council, the state will ensure justice is served, noting that it is a principle that was provided for in the constitution. “The Prerogative of Mercy is a constitutional power granted to the governor under section 212 subsection 1 of the 1999 Constitution as amended, which allows the governor to grant any person respite from execution or any punishment after consultation with an advisory council on Prerogative of Mercy as may be established by the law of the state. “It is important to note that the advisory council on Prerogative of Mercy has been provided for by the Bendel State Advisory Council on Prerogative of Mercy Law Number 11, 1980,” he said. He said he was confident that with the composition of the Advisory Council, the principle of the prerogative of mercy would come into force to decongest prisons. The Chairman of the Advisory Council, Hon. Justice Peter Isibor said the council will equitably discharge its duties. “We will be dealing with people who are already convicted by a superior court of the land and ensure only persons who deserve mercy are recommended for state pardon,” he added. The 15th International Maritime Seminar for judges has concluded in Abuja with participants focusing on the applicability of international treaties on Nigerian maritime law. In view of the critical role played by treaties in international life, participants were of the view that states should domesticate their freely assumed obligations, which are considered basic in relationships between and among states and subjects of international law. The three-day conference attracted participation from within and outside Nigeria. There were judges and States Attorneys-General, senior government functionaries, maritime operators and scholars. Organized by the Nigerian Shippers’ Council in collaboration with National Judicial Institute (NJI), the seminar aimed at keeping judges abreast with the basic contemporary knowledge about admiralty law and practice in the administration of justice. The seminar equally provided platform for exchange of ideas and experiences, especially with regards to implementation of international treaties, piracy and armed robbery at sea as well as other legal issues arising from the maritime sector of the economy. Former Dean, Faculty of Law, University of Lagos, Professor Akin Oyebode, while addressing participants, held that although, international law prescribes the obligation to implement treaties, yet, in a federal system of government, implementation is often encumbered by problems arising from division of powers between the federal and constituent units. He also referred to Section 12 of the 1999 Constitution, which stipulates that no treaty between the federation and any other country shall have the force of law except to the extent to which the National Assembly has enacted such treaty into law. “However, it is worthy of note that not every treaty concluded by Nigeria warrants implementation by way of enabling legislation. “Only those which one way or another, affect existing legislation require implementation by way of legislative action. “Accordingly, treaties which impose financial, political and social costs, or which are strictly of a scientific or technological nature require legislation for their implementation while mutual exchange or cultural agreements generally do not necessarily have to be implemented through legislation”, Oyebode stated. In his reaction, the Director General, Ghana Chamber of Commerce, Dr. Kofi Mbiah, wondered whether the constitution is inferior to international law since it cannot be used as justification for flouting international law. He goes on to state that the supremacy of international law in the international field does not entail that judges in the municipal courts of the state must override local law and apply international law. According to him, a very important aspect of the adherence to international law principles is the duty, not only to accept the instruments but also, to implement its tenets. Speaking on the judicial interpretation and economic implication of piracy and armed robbery at sea, the Executive Director, Centre for Maritime Law and Security in Africa, Dr. Kamal-Deen Ali, regretted that in view of the fact that piracy has been a subject of international attention for a long period, legal framework and judicial interpretation of the crime was yet to be fully defined. He noted that in both local and international law, the legal evolution of piracy law has been marked by difficult questions of definition, interpretation as well as practical application of the law to facts. With the increasing activities of pirates, the Executive Director warned that legal interest in piracy can only be expected to be high. “Also, with the global shipping and the contingent maritime, economic and national concerns, interest in the legal framework of piracy and armed robbery will remain high on global agenda”, he added. He described piracy as that which shares class only with few other crimes including genocide, war crimes and crimes against humanity. He also frowned that even though piracy has long been regarded as a crime that is subject to universal jurisdiction, there were some practical and legal challenges that have militated against smooth prosecution and incarceration of pirates. “By no means do all states have adequate and up to date domestic laws to criminalize piracy. Also, the costs of prosecuting and incarceration have proved strong disincentives to action. Earlier while declaring the seminar opened, the Chief Justice of Nigeria (CJN), Justice Walter Onnoghen tasked judges to continuously acquire trainings in maritime law to enable them handle technical legal matters that may spring from the operations in the industry. Justice Onnoghen, who stressed the crucial role of the maritime sector to the nation’s economy, however believed that Nigerian judiciary has not failed in playing the constitutional role in the growth of maritime industry. Yet, “the economic development of the country through efficient judicial interpretation and resolution of disputes emanating from the sector is indispensable,” he said. He added that necessary skills in the administration of admiralty law and practice in the justice system was imperative as adjudication on such subject can only be performed optimally when judges are up to date with emerging trends in jurisprudence pertaining to that specialized area of law. Justice Onnoghen added that domestication of some principles of international admiralty laws into Nigerian Legal framework was significant towards ground-breaking legal practice in the sector. 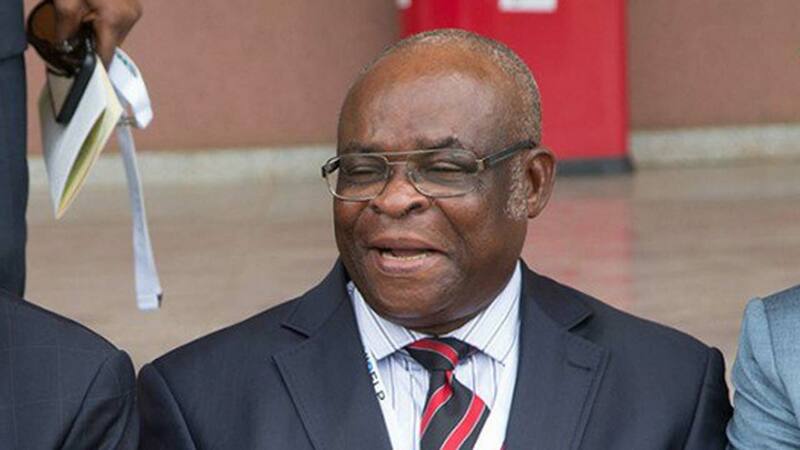 Again, the CJN canvassed efficient engagement of the Alternative Dispute Resolution (ADR) mechanisms, stressing that conciliation and mediation process had proven to engender expeditious resolution of maritime cases. Also speaking, the Attorney General of the Federation and Minister of Justice, Abubakar Malami (SAN), stated that the seminar was in line with the efforts of the National Judicial Council to encourage training of judges in specialized fields such as maritime law. In view of the fundamental role of the maritime sector in facilitating conduct of global trade and commerce, the minister harped on the need for requisite human capacity to enable the country take advantage of opportunities in the sector. “If our judges lack the requisite training and competence to adjudicate in maritime disputes in a fair and effective manner, it will, without doubt, lead to a loss of confidence in the Nigerian business environment. “In the light of our reliance on the oil and gas industry as well as the increasing focus on non-oil exports, which are all activities that require a safe and predictable maritime landscape, all agencies and institutions charged with the diverse facets of the responsibility for maintaining the sanctity of our national maritime space, must play their roles diligently to ensure national survival”, he stated. Listing the challenges posed by piracy, illegal oil bunkering and smuggling of goods through maritime channels, the minister called for synergy between the regulatory and security agencies as well as the judiciary. In his remarks, Minister of Transport, Chibuike Amaechi, decried non-inclusion of admiralty law in school curriculum. This, he said, was responsible for slow dispensation of admiralty law as justices and judges lacked adequate knowledge to guide in the disposition of such cases. “This, coupled with the fast pace of development in international trade law, exert a lot of strain on our judicial officers who only come into contact for the first time with admiralty law in the courtroom, when such matters are brought before them for adjudication”, he noted. To address the situation, the minister stated that several efforts have been made, including setting up of a ministerial committee to introduce basic admiralty law into university curriculum. Chairman, governing board of the Council, Mai Mala Buni, stated that as one of the highest revenue generation sectors, maritime industry deserve adequate attention for better results. He also urged maritime lawyers and judges to always avail themselves of such opportunities for enhanced knowledge of the sector. “The maritime business as we all know is international in nature, I therefore urge our maritime experts to regularly participate in international seminars in order to widen their knowledge and be better positioned to handle issues relating to the development of the sector”, he said. There were also Chief justices and judges from West African sub-region at the seminar. Among them are, Chief Judge, High Court of The Gambia, Justice Hassan Jallow, Justice of the Supreme Court of Sierra Leone, Justice Abdulahmid Cham as well as the Justice of the Supreme Court of Ghana, Justice Nasiru Sule Nana Gbadegbe. Justice Jallow who led a three-man delegation of his country, commended the efforts of Nigerian Shipper’s Council in fostering greater participation in the seminar. He noted that the forum has served for better understanding of maritime law, stressing that both countries shared a lot of similarity in maritime jurisprudence. The Chief Judge also commended the CJN for deploying additional three judges to the country, and expressed hope that the cooperation between Nigeria and The Gambia will continue to flourish. For Justice Cham and his country’s delegation, the annual seminar has over the years, helped in improving their understanding of maritime law, which was instrumental to the adjudication of some cases. He also decried the fact that maritime law was not taught in most universities across the sub-region. According to him, there was need for capacity building in maritime law for judges, and “the seminar was going to provide that”, he stated. Justice Gbadegbe in his goodwill message equally admitted that in view of the crucial position of maritime to the economy of individual countries, there was need for experience sharing on the subject matter. “The seminar has been of immense value for sharing experiences with judges on the ways they handle maritime case,” he noted. The Lagos State University (LASU), Ojo, on Tuesday released its merit admission list for the 2016/2017 academic session. NPFL star Izu Joseph who plies his trade with Shooting Stars Sports Club (3SC) is dead. The defender died on Sunday in Bayelsa where he was holidaying following the just concluded Nigeria Professional Football League after a stray bullet hit him. The deceased defender, Izu Joseph, was part of the Oluyole Warriors which finished 14th at the just concluded 2015/2016 season of the Nigerian Professional Football League, NPFL. 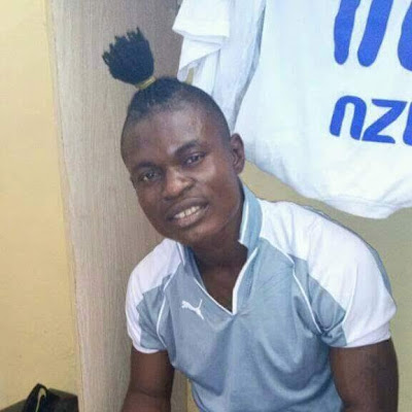 The post NPFL star, Izu Joseph is dead appeared first on Vanguard News.